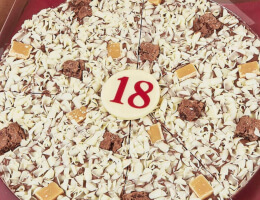 Say happy birthday to your family and friends with one of our delicious gourmet chocolate pizzas. You can’t go wrong with chocolate as a gift, everyone loves it, but rather than buying the generic brands everyone else does, why not surprise them with something different. 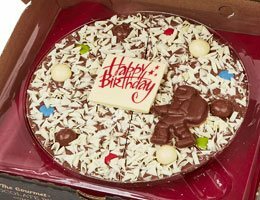 Our solid Belgian chocolate Happy Birthday Pizzas are unique, come in a variety of flavour options, contain more cocoa than the standard offering and can be personalised with your very own birthday wishes. Our 'Happy Birthday' pizzas come in a variety of flavour options. All our pizzas have a solid Belgian milk chocolate base and then are topped with chocolate curls and other flavoursome toppings depending on your preference. For example, you may choose to combine your sweet tooth with your chocolate craving and opt for jelly beans or you could opt for more indulgent toppings like fudge, honeycomb and marshmallows. 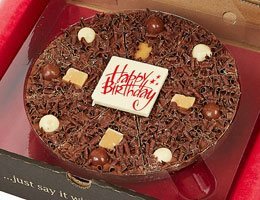 To really mark the occasion, each of our birthday chocolate pizzas have a chocolate plaque in the centre saying Happy Birthday. This plaque can also be personalised to contain the name or age of the person celebrating, so whether it's a child's birthday or an adult reaching their 18th, 21st, 30th, 40th, 50th, 60th or beyond birthday - a personalised chocolste plaque will help to mark the occasion in style. Our chocolate pizzas are a unique and luxury gift that can be customised to suit the recipient’s personal taste. They go beyond the standard box of chocolates and add a personal and surprise element. Plus, our pizzas come in gorgeous packaging complete with gift wrap which helps make the gift feel that little bit more special. You can choose one of our chocolate pizzas for a younger person also. We have a boy’s pizza with chocolate astronauts and footballs on top of the chocolate base, and a girl’s pizza with chocolate flowers and hearts. Both come, of course, with a happy birthday plaque also. Our chocolate birthday presents are ideal gifts if you’re struggling to find something for someone who has everything. Chocolate will always be a welcome gift but with our unique designs, yummy tastes and personalisation, you can guarantee they will love it even more.